9 BC - c.400 AD West of the Danube River part of the Roman Empire. c.400 - 454 Hun rule based in Pannonia. 454 - 526 Ostrogothic rule (see Italy). 526 - Apr 568 Lombard (Langobard) rule (see Italy). Apr 568 - c.805 Avar rule Pannonia. rule to the east of the Danube. c.896 Hungarian (Magyar) settlement of the Danube plain. claimed in the Pacta Conventa. whom Pope had already earlier declared a crusade. 14 Jan 1301 End of the founding Árpád dynasty. crowned King of Hungary at Zara in Dalmatia. of Austria 23 Aug 1440 - 4 Sep 1452. 29 Jun 1440 - 10 Nov 1444 Personal union with Poland. 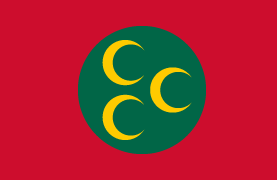 occupied until 29 Jul 1491.
right of succession (ratified 6 Dec 1491). 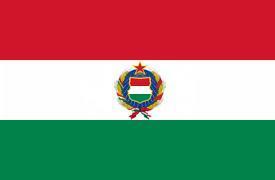 is elected king of Hungary and crowned next day. (from 29 Nov 1780, Habsburg-Lothringen) dynasty. Poland. Szápolyai is defeated again 20 Mar 1528.
intervention and submits to Ottoman suzerainty. a "duke" only (peace ratified 10 Jun 1538). 29 Aug 1541 Ottoman rule in Buda (Ofen) by submission. 29 Aug 1541 - 26 Jan 1699 Partitioned between Austria and Ottoman Empire. 19 Jun 1547 - 11 Nov 1606 Austrian Hungary tributary to the Ottoman Empire. 2 Sep 1686 Austrian Habsburg forces liberate Buda (Ofen). 26 Jan 1699 Austrian Habsburgs expel remaining Ottoman forces. 19 Jul 1831 - Aug 1831 Great peasant uprising in north eastern Hungary. 15 Mar 1848 Hungarian Revolution of 1848 begins. revolutionaries 21 May - 18 Jul 1849). 14 Apr 1849 - 13 Aug 1849 Independence from Austria declared (Hungary). 17 Jun 1849 Russian begins invasion on behalf of Austria. 5 Sep 1849 Peterwardein and 27 Sep 1849 Komorn). 13 Sep 1850 Provisional civil administration established. 20 Oct 1860 Hungarian diet restored, limited self-rule. ("Lands of the Holy Hungarian Crown")(incl. Croatia, Fiume, Slavonia and Transylvania). 28 Oct 1918 Independence of Czechoslovak State declared. 29 Oct 1918 Independence of Croat and Slovene State declared. 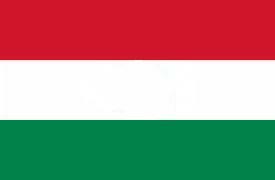 31 Oct 1918 Hungary declares independence (Hungarian Kingdom). 2 Aug 1919 Hungarian People's Republic (restored). 4 Aug 1919 - 14 Nov 1919 Occupied by Romania. 6 Aug 1919 Hungary (monarchy tacitly restored). of Trianon (ratified on 21 Jun 1921). Habsburg rights to throne are voided 6 Nov 1921. 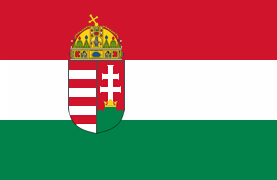 (also annexed 16 Mar 1939) ceded to Hungary. 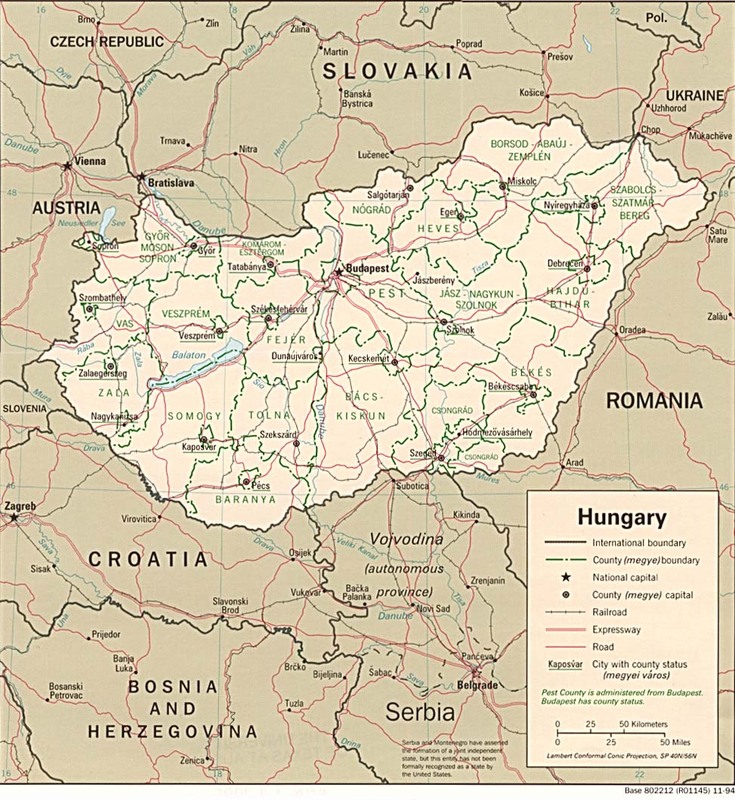 30 Aug 1940 - 11 Mar 1945 Northern Transylvania annexed from Rumania. 1 Apr 1944 - 4 Apr 1945 Occupied by Germany. 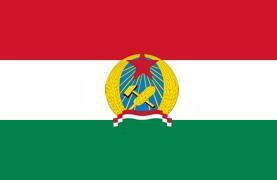 19 Oct 1944 - 15 Sep 1947 Allied (Soviet) occupation. by Paris Peace Treaty (ratified 15 Sep 1947). - Károly Hencz (b. 1877 - d. 1949?) FNP/F48? Noble and Ecclesiastical Titles: báró/freiherr = baron; bíboros = cardinal; érsek = archbishop; főherceg/erzherzog = archduke; fejedelem/fürst = prince; gróf/graf = count; herceg/herzog = duke; püspök = bishop; ritter = knight; vitéz = sir (knighthood). The style apostoli (apostolic) was granted by the Pope on 19 Aug 1758, effective 1 Oct 1758. The term Kyrálynö (queen-regnant) literally means "female-king", and was rendered Rex (not as Regina) in the official Latin, the term Királynö is therefor different from Kyrályné (queen-consort}. ²The Palatine, in Latin palatinus regni, in Hungarian nádorispán, was the traditional highest court official of the kingdom, who stood at the head of the magnates and if necessary was called upon to mediate between the crown and the estates. No appointments to this exalted office were made after the 1848-49 revolution. ³Formal styles of the prime ministers: Miniszterelnök (minister-president) 10 Mar 1867 - 5 Sep 1949, 24 Oct - 4 Nov 1956, and from 23 Oct 1989; a Minisztertanács elnöke (president of the Council of Ministers) 5 Sep 1949 - 24 Oct 1956, 278 Jan 1958 - 30 Jun 1965, and 15 May 1975 - 23 Oct 1989; a Magyar Forradalmi Munkás-Paraszt Kormány elnöke (president of the Hungarian Revolutionary Workers' and Peasants' Government) 4 Nov 1956 - 27 Jan 1958 and 30 Jun 1965 - 15 May 1975; and during 16 Oct 1944 - 28 Mar 1945 Szálasi was Kormányelnök (government president). Territorial Disputes: Bilateral government, legal, technical and economic working group negotiations continue since 2006 with Slovakia over Hungary's failure to complete its portion of the Gabčíkovo-Nagymaros hydroelectric dam project along the Danube; as a member state that forms part of the EU's external border, Hungary has implemented the strict Schengen border rules. Zombor/Sombor) of Hungary occupied Serbia/Yugoslavia. 1921 in Baja, 22 Aug 1921 in Pécs, completed 25 Aug 1921). Dec 1919 - 18 Aug 1921 Svetislav Rajić (b. 1889 - d. 1941) Non-party?